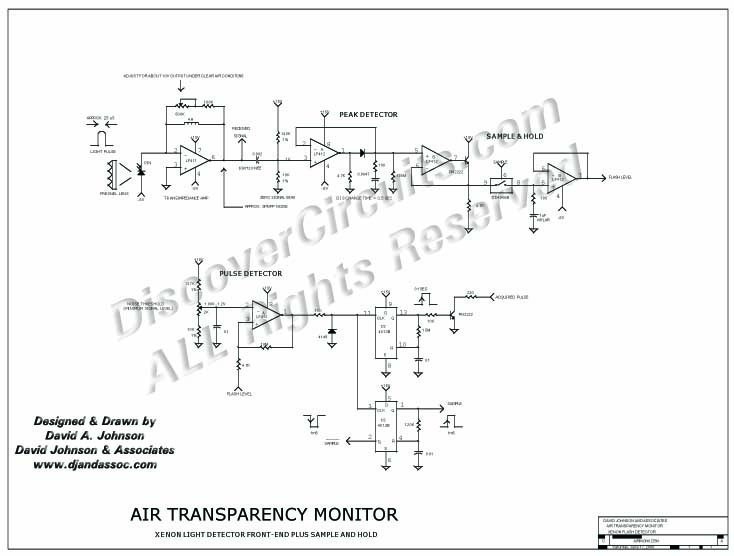 Circuit: Air Transparency Monitor, Xenon Flash Receiver __ Circuit designed by David A. Johnson, P.E. I designed this circuit many years ago to monitor the quality of a mile long column of air for future optical communications experiments. The transmitter system (circuit 72 below) uses a powerful xenon flash in conjunction with a large 12 inch fresnel lens at the transmitter end and a matching 12 inch lens with a PIN photo diode at the receiver. The receiver system was connected to a weather station and a computer to collect the changes in intensity of the light flashes under different weather conditions. It has the potential for a 30+ mile range. I have also used this system to conduct cloud bounce experiments.